Ninety miles from Dubai, another Xanadu has been decreed. 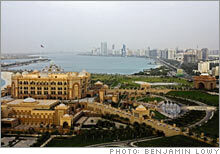 Its name is Abu Dhabi, and that $3 billion hotel is just the beginning of the story. 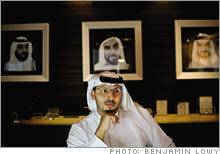 (Fortune Magazine) -- Khaldoon Khalifa al Mubarak is a man in a hurry. The 31-year-old, American-educated developer steps on the gas of his silver Audi and zooms past a hole in the ground crawling with construction workers - the future home of a $1.3 billion complex featuring three skyscrapers, two five-star hotels, and a souk. The car zips by a new $3 billion hotel that boasts 1,002 Swarovski crystal chandeliers and a gold-leaf dome larger than the one atop St. Paul's Cathedral in London. In the distance, glittering in the aqua-blue Persian Gulf, are dozens of islands that will one day sprout skyscrapers, hotels, museums, hospitals, and factories financed in part by the government-owned investment company that Khaldoon runs, Mubadala Development. In all, plans call for almost $200 billion to be spent here over the next ten years. The Emirates Palace hotel and the skyline of Abu Dhabi. Khaldoon Khalifa al Mubarak sits in front of portraits of Sheikh Zayed and sons Khalifa and Mohammed. 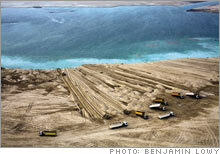 No cranes yet, but hundreds of dump trucks like these on Al Raha Beach are paving the way for development. A $6.8 billion airport expansion includes a runway wide enough to land Etihad Airways' Airbus A380 jets. "We move fast," Khaldoon says, his crisp, white headscarf whipping in the wind. "Think about it: How many places in the world can you say, 'I'm going to establish an airline,' and boom, two years later you have 21 planes and 37 destinations? How many places in the world can you say, 'I need 15,000 hotel rooms,' and boom, you have 100 new hotels in the works? How many places can you say, 'I want world-class hospitals, universities, and museums,' and boom, the Sorbonne, Cleveland Clinic, Guggenheim, and Louvre are on the way?" Welcome to Abu Dhabi, the capital of the United Arab Emirates and the richest city in the world. The emirate's 420,000 citizens, who sit on one-tenth of the planet's oil and have almost $1 trillion invested abroad, are worth about $17 million apiece. (A million foreign workers don't share in the wealth.) Yet most people couldn't find Abu Dhabi on a map. Khaldoon's job is to change that. Tall, handsome, and politically savvy, he wants to make his hometown mentioned in the same breath as Singapore, Tokyo - and yes, Dubai. But does the UAE, a federation of seven emirates strung out along the Persian Gulf, need another Dubai just a two-hour drive away? Does it need another long-haul airline, another financial center, another tourism destination, another billion-dollar hotel? "The short answer," says Khaldoon, "is yes. But I don't like to use comparisons with Dubai. We're not trying to be Dubai. What they've done is phenomenal, and we're very proud of it. But here we have a unique opportunity to get it right." That's a subtle dig at Abu Dhabi's brash neighbor to the north. On the surface, what's happening in Abu Dhabi mirrors Dubai. But what's driving growth here is different. Dubai is a story of survival - how one small city running out of oil saved itself with a mixture of tourism, commercialism, and pizzazz. Abu Dhabi doesn't need to do anything. It has the oil reserves and the financial cushion to sit back and watch the Dubai experiment. But the leaders of a new generation want more. And they want it on their terms, with all the splendor and none of the crassness that has afflicted Dubai. "They know they also have to diversify their economy away from just oil," says Christopher Davidson, a political science professor at Durham University in Britain, who has written a book on the UAE. "But there's also a bit of rivalry. Abu Dhabi is peeved that Dubai is internationally recognized and it isn't." Khaldoon's cellphone rings. "Hello, boss," he says, then whispers, "When the crown prince is on the phone, you answer." The 46-year-old crown prince, Mohammed bin Zayed al Nahyan, has been calling a lot lately. With three dozen construction projects planned in Abu Dhabi, plus infrastructure investments in Algeria, Pakistan, and other countries, there's plenty to talk about. "He's like a CEO running a major corporation," Khaldoon says. "He wants results, and he wants them now." The city of Abu Dhabi sits at the tip of a T-shaped island jutting into the Persian Gulf. Wide tree-lined boulevards run through clusters of utilitarian concrete-slab high-rises and modern mirrored towers. An elegant corniche stretches the length of the city along the coast. There are finely manicured roundabouts, abundant fountains, and more trees than anywhere else on the Gulf. But it's oddly quiet - there's little traffic, few pedestrians, and no nightlife to speak of. That's all about to change. From a helicopter you can see sandy islands covered with dump trucks and crisscrossed with empty highways sitting offshore like blank canvases. It's a stark contrast to what lies just 15 minutes up the coast by air: a landscape of cranes, yacht harbors, man-made islands in exotic formations, and what will soon be the tallest building in the world. There's nothing subtle about Dubai. Its crowded, smoggy skyline is part Miami, part Las Vegas, and all new. There's scarcely a plot of open space or an uncongested highway. As much as Khaldoon and others say they don't like to make comparisons, it's impossible to avoid them. Abu Dhabi and Dubai operate like family businesses. While the Maktoum family of Dubai and the Nahyan family of Abu Dhabi are cousins, they were born in very different neighborhoods. The population of Dubai, an emirate the size of Rhode Island, was concentrated in a small merchant community that capitalized on the town's sheltered and navigable creek. 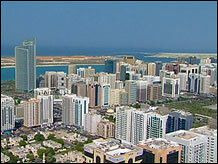 Abu Dhabi, roughly the size of West Virginia, was much poorer. Bedouin tribesmen roamed the desert; pearl divers lived in huts where the city is today. Then, in 1958, British explorers discovered what would turn out to be the world's fifth-largest crude reserve, 90 percent of which was under Abu Dhabi. That discovery - and the wealth that came with it - made the Nahyans the dominant family in the region when the British pulled out in 1971. Sheikh Zayed bin Sultan al Nahyan, the ruler of Abu Dhabi, became President of the newly independent UAE, while Sheikh Rashid bin Saeed al Maktoum of Dubai became Prime Minister. 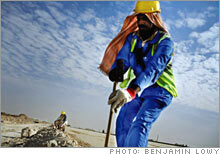 Zayed set out to carve a modern country in the sand. When the oil started flowing, the city of Abu Dhabi had just 46,000 people, four doctors, and five schools. Rich people had mud houses; poorer families built with reeds. "As students, we were provided with books, transportation, and a small salary," remembers Mohammed Ahmed al Bowardi, a longtime government advisor. "Sheikh Zayed, our country's George Washington, realized that the people needed an incentive to come to school. So that 100 dirham [about $27] meant a lot to us."